Based on preliminary subscriptions about measurement technology the following instruments have been used during ALD inspection. All of the instruments represent the latest, most advanced technology manufactured by the market leader SebaKMT Company (member of the MEGGER Group). For large diameter Trunk Mains, all available metallic contact points of the Mains were checked - valves, hydrants, any pipe connections. All the valve and hydrant boxes, manholes which were important as contact points had been cleaned-up before ALC measurements were done. Night-time measurements are more effective for leakage control inspection because of the low level of industrial and domestic water consumption and low noise level origin from traffic load. 0. step : preparation of the night-shift measurement, preparing detailed maps of the pipeline system, signed existing fire hydrants, valves and other metallic contact points. 1st step : installation of the 6 pc of multisensor in order to collect structural noises of the pipeline collected and for offline correlation to locate pipeline failures. 2nd step : collection of the multisensors, mapping with GPS coordinates,downloading and processing collected data, short correlation analysis process. 2/B step : installation of the 6 pc multisensors on the next section to collect data, during short analysis of the previously measured section. First correlation process among logged noise data with Correlux C-3 instrument. 3rd step : in case of certain noise level and appropriate coherences between noises, doing correlation process among the collected noises. In case of clear correlation signals a double checking process was done with online correlation instruments between noisy elements. Hydrophone-correlation process couldn't be done because of the condition of the hydrants' rough sealing surface. 4th step : pin-pointing of the failure by touch and ground-microphone, painting a signal of the failure sight on the asphalt surface + mapping with GPS coordinates + protocol / measurement report. One measuring cycle means: installation of 6 pc offline data logger / collection / data downloading and processing works / short analysis of the measured section / double check with online correlation instruments / pin-pointing of the failure by touch and ground-microphone / signal of the failure sight on the asphalt surface + mapping with GPS coordinates. As daily performance 2 - 5 pc of full measuring cycle / night was available to do with approx. 1 - 2 hours / cycle. In case of clear correlation signal and high noise level (in case of failure) an online correlation and pin-pointing process was performed on the pipe section. Failure was reported to dispatching centre just immediately after pin-pointing process had been done. can be analysed during correlation processes. 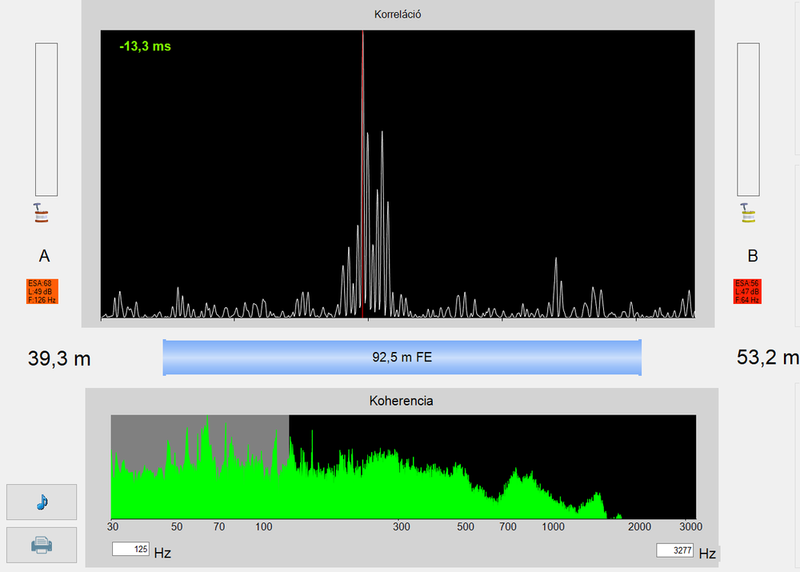 - frequency (F in Hz) of the leak noise are shown. The colour of the box shows the approximate frequency of the noise in Hz. The correlation diagramcorresponds to the maximum possible frequency band of the measuring system (0 - 3277 Hz). The frequency range being analysed in the correlation process and the results are displayed and marked in a coherence diagram. The trace shows the frequency spectrum of the measurement. Meters: Distance to the leak from the first (A) and second (B) measurement point in metres. All measuring details are summarised in excel table form and attached to the ALD report as Attachment. In most of the cases only a low level of noise signal was detected, which originated from traffic, maintenance works, temporary water consumption or irrigation system, etc. - another failure was detected on North Terrace at the Adelaide Hospital on the feeding pipeline of the Combined Booster system, where a detailed investigation should be considered, which will require the participation/approval of the local authorities owning connected assets (closing valves, stop booster, impact hospital operations, etc.). - Two other noisy sites were inspected- irrigation systems were running at the time of the measurements. 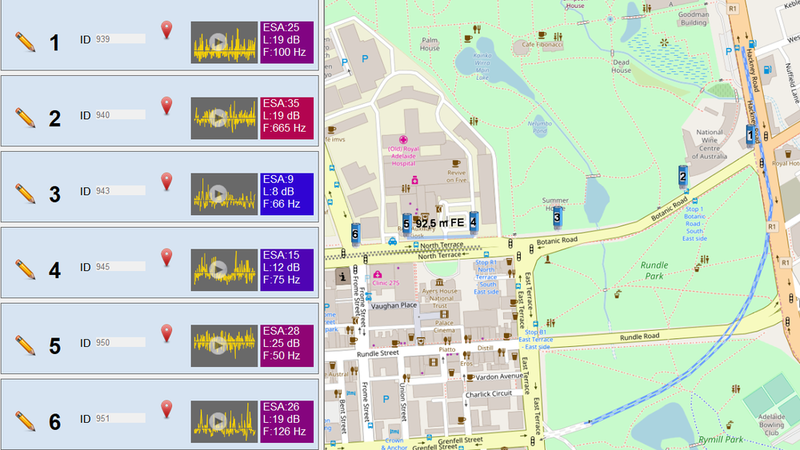 In each case of high noise level, repeated online correlation process(es) were done. The results of the processes - correlation diagram with distances from transmitters - are attached to this report.